All Blacks skipper Richie McCaw will miss the opening six weeks of the Super Rugby season as the result of a stress fracture in his right foot. The Crusaders flanker was set to sit out the opening two rounds of the tournament as part of a rest period but will now not see any action until week seven. McCaw was injured during a running fitness test at Rugby Park in Christchurch last week, with scans confirming a stress fracture in the fifth metatarsal on his right foot. The 30-year-old will have a screw inserted into the bone during surgery next week and his All Black team-mate Kieran Read will take the Crusaders armband in his absence. "The injury is obviously disappointing but it's not likely to be one that will bother me in the long term. 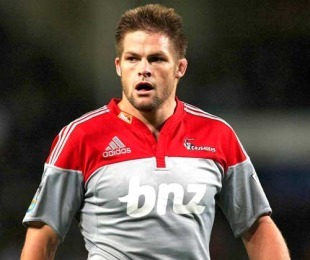 I'll have the operation and then get on with my rehab and look forward to turning out for the Crusaders when I'm given the all-clear by the medical staff," McCaw said. "I had a pretty good break away from the rugby environment but I was about to get back into training last week and I was really looking forward to throwing the ball around again, I was feeling pretty good."